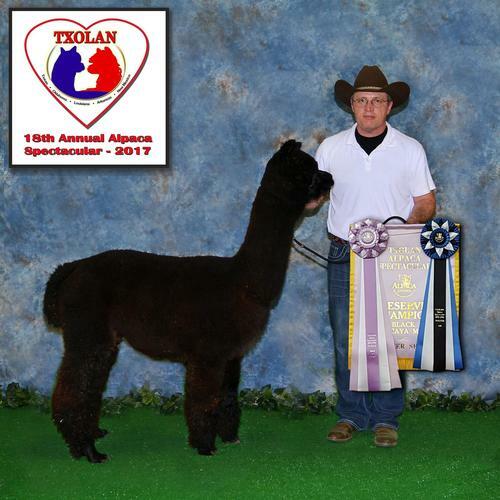 2017 TXOLAN Spectacular -- Reserve champion in both halter and fleece! 2016 Futurity - Fantastic judgement as the competition was intense! 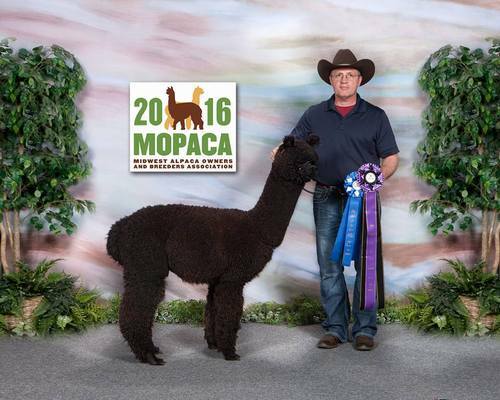 2016 MOPACA -- Color Champion! His maternal grandsire is champion fawn 'Rumaki', a Royal Fawn son with the bloodlines of Presido and Felix. His paternal grandsire is the well known Snowmass Nova's Dark Quest, son of the famous Snowmass Nova, son of Snowmass Peruvian Casanova. 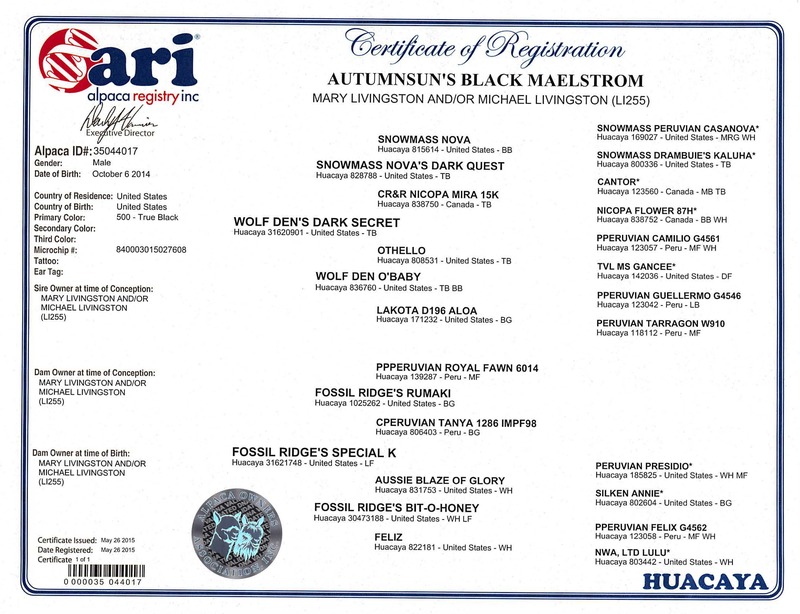 In Maelstrom, you have a list of "who's who" merging into a TRUE BLACK 7/8 Peruvian cornerstone herdsire. Maelstrom brings together the awesome shine and fine, uniform handle with tight crimp from his dam and Secret's inky-black similarly crimpy, shiny, and consistent fiber. Though both dam and sire have great coverage, Mael's head leans toward his sire's beautiful headstyle that cannot help but catch the eye. He is well conformed and balanced in his frame. 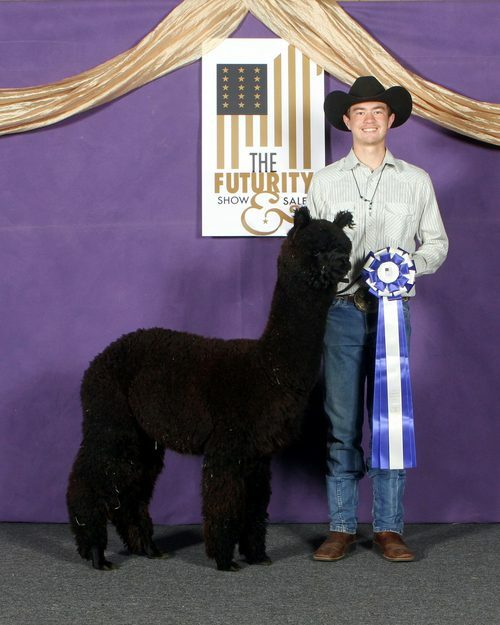 He is showing his merit in the show ring, standing in good company with males of similarly notable bloodlines. 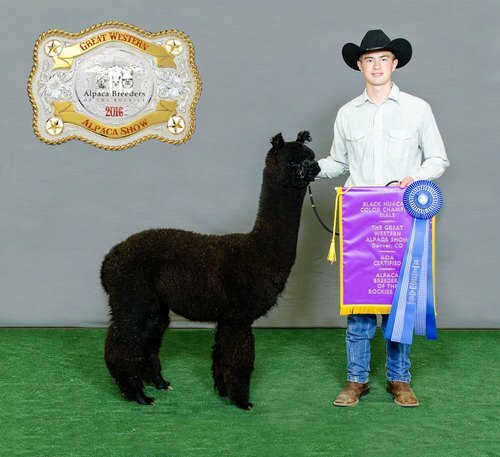 He rounded out the 2016 season with first and/or Cc & RC at notable shows like TxOLAN, MOPACA, AOA National, Futunity, and GWAS. 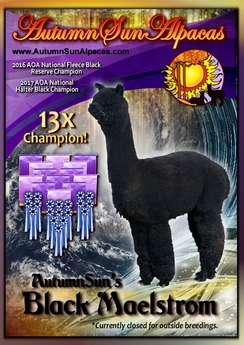 Not least the least is his champion banner from the 2017 AOA National Fleece Show and the 2017 AOA Halter Show. 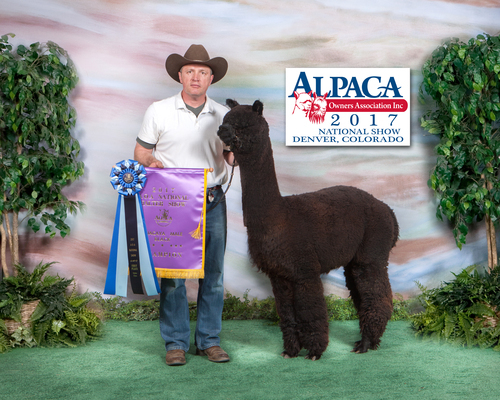 He and his pen mate are a dynamic duo, taking halter and fleece shows by storm, gathering up banners as well accolades and intense interest. 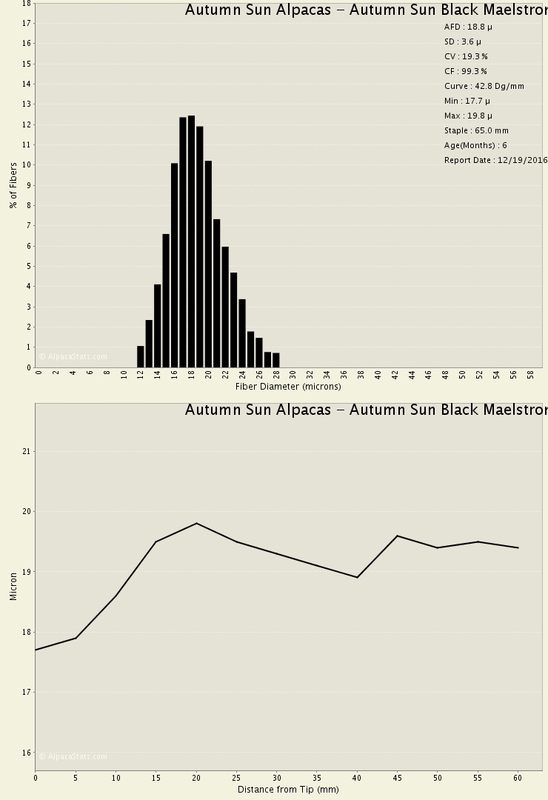 When they touch him, judges and fellow alpaca farms comment on his density, crimp and buttery feel. Maelstron is currently closed to outside breedings as of May 10, 2017. All contracted breedings with down payments by the closing date will be allowed to breed through 2018. Cannot wait for the Mael babies! 1st @ 2017 AOA National Fleece Show, True Black 2 yr old, Ursula Munn "beautiful handle & brightness"
Maelstrom is not for sale at this time.